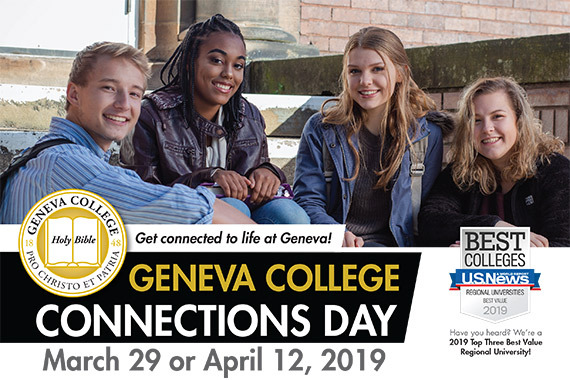 (BEAVER FALLS, Pa.) – Geneva College invites admitted students and their families to connect with its Christ-centered academic community on Friday, March 29 or Friday, April 12 from 8:30 a.m. to 3 p.m. at Connections Day. To register for Geneva College Connections Day, students and families can visit: Geneva.edu/connections. Students attending Connections Day experience life on campus. They meet with faculty members in their intended major, learn how to register for courses, participate in fun events led by the Center for Student Engagement, find out how to get involved by signing up for extracurricular activities, eat lunch in Alexander Dining Hall, and explore campus. In addition, they also have the chance to meet peers and begin building friendships with future classmates. Students attending the Scholarship Recognition Dinner the night before are invited to stay overnight with a current Geneva student in one of the residence halls before joining the events of Connections Day the next morning. All attendees are entered into a prize drawing with the opportunity to take home helpful items that are handy for new Geneva students.